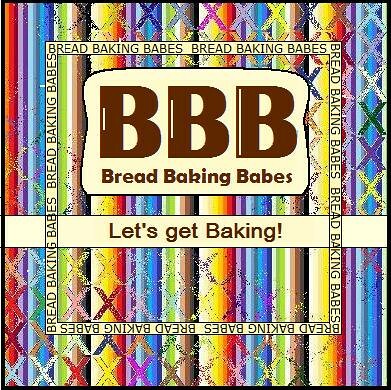 Bake My Day! 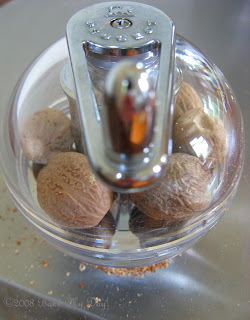 : Gadgets that work: Nutmeg grater! 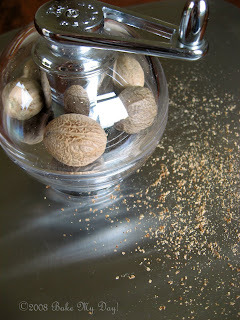 Gadgets that work: Nutmeg grater! This is the new and improved version of the old. For years I've had an oblong metal grater with that little knob on top where you could store the nutmeg in use. I've grated with pleasure, enjoying the fresh smell and grated knuckles. But now my dear readers, you could say I've upgrated.. This little one has got the looks, the style, the name and oh yes, this baby works! I'm in love. Geweldig je heb'm! Ik weet nog dat hij toen in Utrecht naar je stond te lonken! Geweldig hè mooie gadgets die zo heerlijk werken, gefeliciteerd! This gadget will save my fingernails from the imminent danger they face each time I use my plane grater! Gotta get one! Helpful hint: clean the little teeth which hold onto the nutmeg, and around the blade, after you've finished with a nutmeg nut. Otherwise, it may end up spinning, not grinding the nut, and merely chewing an odd hole in the top. Otherwise, great gadget! Oooooooooh! Another gadget to add to my list of gadgets to buy ... love it! I will have to be on the lookout for one now. But I'm still enjoying my old metal one with it's little nutmeg house. But beautiful and it works is grand. I had to smile because I bought exactly the same mill on Saturday here in Munich and I feeel the same "This baby works. I love it!" Karen, I've upgrated today too... not to your level (of course),but with a Microplane nutmeg grater. It's great too, I love it. It just smells so good when it freshley grated, I have to control myself not to sprinkle it on everything, because the grating is so much fun. (If my family starts hallucinating, you'll know why). Oh, yes, the grated knuckles. I remember my mother's spice cookies fragranced with nutmeg and fresh band-aids. This looks like a mighty slick toy! Hi, this is dondon of mustlovefood.com a social network of foodies like you meet and chat. Thanks a lot and hope to hear from you. @David: Thanks! Great advice, you are so right! Another one: don't try to grate directly above a steaming pan... it'll clog the innards. I grate in my cupped hand and sprinkle. Oh boy do I grate and sprinkle! Yes Lien let's start a nutmeg club my family is already walking around with a dazed smile on their faces..
Peugeot - the Rolls Royce of kitchenware!